Explore hidden gems such as Sharks Cove and Scuba & Snorkeling. Escape the urban bustle at Kayaking & Canoeing and Kailua Beach Park. 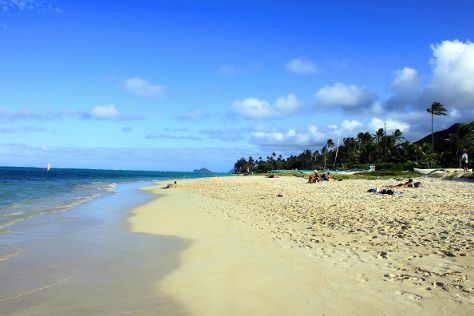 Explore Honolulu's surroundings by going to Lanikai Beach (in Kailua) and Byodo-In Temple (in Kaneohe). Next up on the itinerary: take a memorable tour with Tours, fulfill a lifelong dream with a swim-with-the-dolphins experience, take in the spiritual surroundings of Saint Augustine by-the-Sea, and trek along Koko Crater Railway Trail. For more things to do, other places to visit, reviews, and tourist information, go to the Honolulu trip itinerary maker . New York City to Honolulu is an approximately 14-hour combination of bus and flight. You can also fly. The time zone changes from Eastern Standard Time (EST) to Hawaii Standard Time (HST), which is usually a -5 hour difference. Expect somewhat warmer temperatures when traveling from New York City in May; daily highs in Honolulu reach 84°F and lows reach 71°F. Finish your sightseeing early on the 6th (Wed) to allow enough time to travel to San Antonio. Visit Mission San Jose and Mission Trail for their historical value. You'll explore the less-touristy side of things at Enchanted Rock State Natural Area and Wildseed Farms. Venture out of the city with trips to Frio Canyon Motorcycle Stop (in Leakey), Lost Maples Winery (in Vanderpool) and Fredericksburg (Grape Creek Vineyards Fredericksburg, National Museum of the Pacific War, & more). And it doesn't end there: revel in the low prices at San Marcos Premium Outlets, take a stroll through South Congress Avenue, take an in-depth tour of LBJ Presidential Library, and look for all kinds of wild species at Lady Bird Johnson Wildflower Center. To see where to stay, reviews, maps, and other tourist information, go to the San Antonio trip itinerary planner. You can fly from Honolulu to San Antonio in 12 hours. Alternatively, you can do a combination of flight and car; or do a combination of flight and bus. The time zone difference moving from Hawaii Standard Time to Central Standard Time is 4 hours. Traveling from Honolulu in May, San Antonio is a bit cooler at night with lows of 66°F. Finish your sightseeing early on the 12th (Tue) so you can travel back home.